Needlepoint, Lavender, White Fluff. All different labels for one substance, and one substance only: LSD. It is not correct to say that there are different ‘types’ of LSD. LSD is LSD. So why, then, are there different and distinct effects, durations, and experiences between the various street names or labels for LSD, or even between different sources? The most likely answer: purity. The last step in making LSD, according to this chemist on Reddit, is the separation of the inactive isomers and impurities from the active isomer (d-iso-lysergic acid diethylamide). Only roughly 30% of the the crude product is LSD, “while the rest consists of these inactive isomers and some side reaction products as well.” The impurities found in LSD are inactive in the brain, but many have effects on the body that may contribute to the “body load” of a trip, or even a rough “come up.” The impurities may also contribute to other side effects, such as nausea, balmy palms, and aches in the lower back. “LSD needs to be purified via chromatography twice, once on silica to remove the side reaction products and leftover reactants, and a second time using a chiral substrate to separate the active isomers from the inactive ones.” Batches of LSD with particularly hard come-ups, or with heavy body loads and less visuals, may come from unpurified crude product, containing a mixture of the aforementioned molecules and LSD. Other factors that may contribute to different experiences between batches or sources of LSD are dosage and set and setting. It is nearly impossible to determine how ‘heavy’ blotter is mic’d unless the end user is in the inner circle of the chemist or is the one who lays it themselves from crystal. A standard sized LSD tab can contain anywhere from 50-300 μg, and vials can be diluted at various degrees as well. A higher dose will produce more effects, so LSD sourced from different places can be laid at different micrograms, thereby producing differing effects in the end user. Finally, set and setting, which refers to the mindset of the person consuming LSD and the environment in which the person consumes, can attribute to varying LSD trips. One who is not in a great place mentally or emotionally, or who perhaps has a history of mental illness in their family, may be prone to a more difficult experience on LSD, mentally or physically. Or, if someone chooses to consume LSD in a social setting where they are around strangers, they may begin to feel uncomfortable during an LSD journey, associating that experience as different than other LSD trips they’ve had. So, although there are many variables that may attribute to different effects, durations, and experiences of LSD, LSD is LSD. There are not different ‘types’ of it, but there are certainly batches that are purer than others, or that are laid heavier (and are therefore dosed higher on blotter) than others. The labels, like Needle Point and Lavender, are merely marketing terms, used to designate a certain range of purity of the LSD crystal. Other street names, like the infamous ‘Orange Sunshine’ LSD that was circulating in the late 1960’s, are essentially a brand name to distinguish a particular chemist (in this case, it was Tim Scully and Nick Sand). Help DanceSafe stop the spread of misinformation. If you hear your friends talking about different “types” of LSD, correct them. Knowledge is power! And remember, there are many other substances that are sold on blotter and represented as LSD, such as DOI, 25I-NBOMe, and 1P-LSD. To avoid ingesting adulterated or misrepresented LSD, purchase your Ehrlich’s drug checking reagent here. 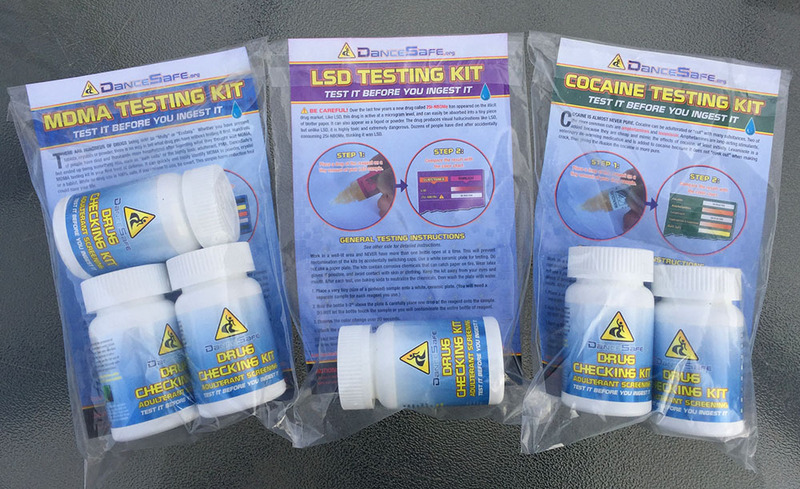 DanceSafe neither condemns nor condones drug use. 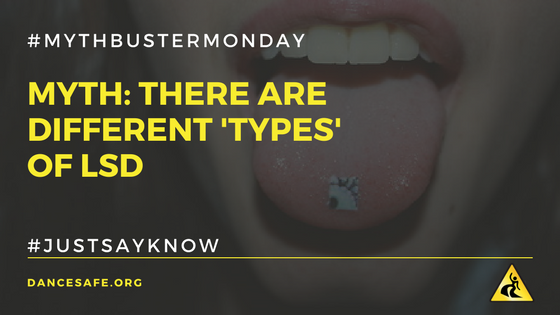 The purpose of #MythBusterMonday is to help stop the spreading of misinformation and to help break the stigma surrounding drugs and drug use. We at DanceSafe believe in drug policy rooted in science, compassion, and public health. If you have a myth related to drugs or drug use, please message us on Facebook with your ideas and they may be featured in our next #MythBusterMonday.